Both Inkee-Bear & Gracee have already rubbed Yalila's shoes, leaving their scents. Now I'm leaving mine. It is always exciting when Yalila is at our house. Do we get in her way? No, we are her little helpers. She laughs & talks to us. 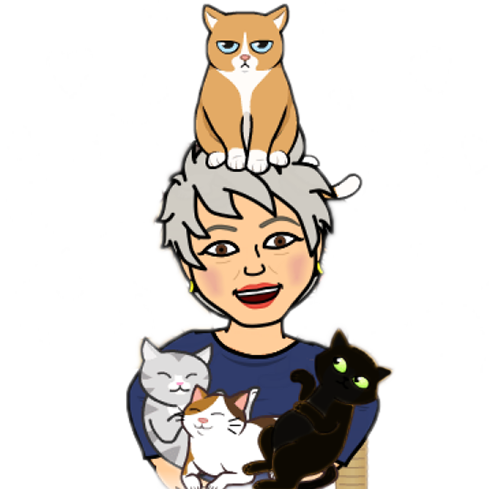 Read Related Mews N News article "Why Do R Cats Rub Against Things?" Moi? Why do I rub against things? Well, for one thing, I feel calmer. As you might already know, I am anxious. By leaving my scent on every thing that I can in our house, I feel more secure. One thing I don't do...I don't rub against Inkee-Bear. Nope, he tries to bully me & he likes Sophee better than me. WHY DO R CATS RUB AGAINST THINGS? Cats rub their faces on and against objects for many reasons, depending on the context or object being rubbed. When our cats rub their faces (mouth, chin, side of face, neck and/or ear) on an item, they are leaving a scent.